HOTEL TRANSYLVANIA is, like PARANORMAN, an absolutely lovely, beautifully drawn, heart-warming children's animation film that pays homage to horror film history. Adam Sandler plays Count Dracula, so scarred my the peasant mob killing his beloved wife, that he turns his castle into a hotel for ghouls and monsters to protect them from the nasty humans in the outside world. His extreme protection irks his teenage daughter Mavis (Selena Gomez) and when she meets a stray backpacker called Jonathan (Andy Samberg) the Count is torn between protecting his daughter from the outside world, and protecting the backpacker from the monsters at the hotel. So ensues some wonderful comedy, with the Count loosening up under Jonathan's influence, and Mavis tentatively entering her first romance. Ultimately, the movie plays a request for tolerance but it moves us because of its loving rendering of a father-daughter relationship. As an out and out daddy's girl myself, I fell in love with it. Kudos to director Genndy Tartakovsky (DEXTER'S LABORATORY) for his gonzo animation style, raucous sense of humour and genuine heart. This is simply an adorable film. 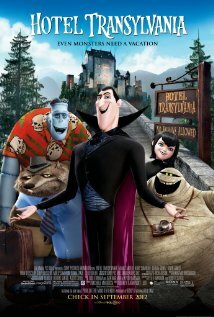 HOTEL TRANSYLVANIA played Toronto 2012 and is on release in Australia, Israel, New Zealand, Canada, Mexico, Norway, the Philippines, the USA, Japan, Argentina, Hungary, Brazil, Colombia, Chile, Ireland and the UK. It opens on October 18th in the Czech Republic, Russia, Serbia, Slovenia, Bulgaria, Estonia, Lithuania and Sweden; on October 25th in Germany, Kuwait, Ukraine and Spain; on November 2nd in Iceland; on November 8th in Denmark, Italy and Poland; on November 19th in Vietnam; on November 23rd in Finland, Indonesia, Macedonia and Turkey; on December 5th in Thailand, Greece, Singapore and India; on December 19th in Belgium, the Netherlands and Portugal; on January 7th in Hong Kong and Taiwan and on February 13th in France. HOTEL TRANSYLVANIA has a running time of 91 minutes and is rated PG in the USA.